ENSENADA, BAJA CALIFORNIA — On the morning of May 21, 2004, Miriam Frías fell, the plastic chair at her 7-year-old daughter’s school collapsing from under her. Even though she was 25 weeks pregnant — and hit her belly as she met the floor — she didn’t give the tumble much thought when it happened. That afternoon she gave her daughter permission to spend the night at her grandmother’s house, opting to spend her own evening resting. While watching the royal wedding of Prince Philip and Letizia of Spain on TV, she began to experience a constant urge to urinate. As she sat on the toilet seat, she gave birth, suddenly, 6 months into her pregnancy, at 33 years old. She was home alone, so she had to cut the umbilical cord and detach the placenta from herself as best as she could. The baby didn’t breathe and didn’t move. Frías bled so much that she fainted. Nearly 18 hours went by before her boyfriend José found her lying on the bathroom floor and took her to the hospital. (Frías requested that Jose’s surname remain anonymous because the two had a falling out in the past and have not remained in contact.) Frías still has gaps in her memory of what happened after she gave birth. The psychiatrists who treated her said she was in a state of shock. What’s known for certain is that the stillborn fetus was later discovered in a backpack. She would spend the next 14 years of her life in jail because of it. According to human rights organizations, what Frías experienced was an “unexpected birth” — a birth that cannot be predicted and one in which the fetus could be born dead or alive. Like most women who have this experience, she was judged on multiple levels: by society, for not fulfilling the role of motherhood; by health institutions; and by the justice system, according to AsíLegal, the advocacy organization that provided Frías with legal counsel. Mexico’s Baja California state has the highest rate in the country of investigations against women who get abortions — 5.4% of every 100,000 women between 15 and 45 years of age have been investigated, according to the latest report Maternidad o Castigo by GIRE (Information Group on Reproductive Choice). Mexico City has the second highest rate, at 4.2%, and then Baja California Sur at 3.3%. From 2015 to 2018, 1,666 criminal offense case files have been opened to investigate abortions in the country. 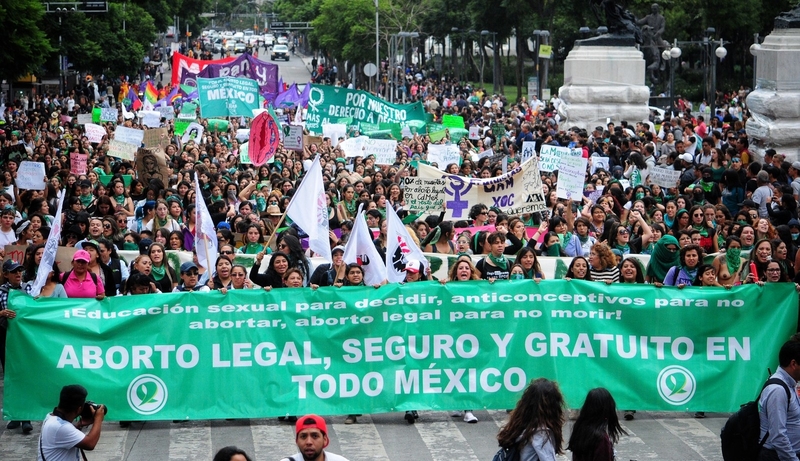 In Mexico, depending on the court and which judge is presiding, sentences imposed against women can be up to six years for getting an abortion, up to eight years for infanticide, and up to 20 years if they are prosecuted for “homicide of a blood relative.” Baja California is also one of 18 Mexican states that “protects life from conception,” a legal measure that infringes on women’s reproductive rights, according to GIRE’s report. According to Adriana Aguilar, an attorney at AsíLegal, there are states that go so far as to take into consideration the woman’s reputation, societal notions of shame and dishonor, the woman’s psychological state, or the opinion of their spouses when pursuing their cases against women. Whether it is an unexpected birth, a miscarriage, or an abortion, Mexican authorities usually base their judgments against women on the idea of motherhood as a natural duty, in an effort to criminalize those who fail to comply with this notion, labeling them “deviants or sick,” according to Aguilar. Frías wanted to name her baby Nadia, and, although it wasn’t a planned pregnancy, the news made her happy. She had a stable life and was about to move with her boyfriend to a new house. They had a crib ready and they wanted to get married. A graduate of the Autonomous University of Sinaloa with a degree in chemistry, Frías was earning a living as a health care representative at several area hospitals. “It wasn’t planned but it wasn’t undesired either. … My partner told them: ‘If she wanted to get an abortion, she wouldn’t have waited to be so far along into the pregnancy and there is no way she wouldn’t know what drugs to take since she is a chemist [pharmacobiologist],’” she told BuzzFeed News. Since she knew that the General Hospital in Ensenada had a good reputation, she went there seeking help. But once she got there, the doctor asked “what she had taken” and “where the baby was.” Even though she was still in a state of psychological shock and recovering from hemorrhages that required several blood transfusions, local authorities were already looking into detaining her. She later said the police went into her house without a search warrant and found the fetus inside a backpack. “That is how the accusation that I had murdered her came about. The baby was dead [when she was born], as simple as that. If I put her there, I think I did put her there, I don’t remember the moment when I did it, or why. What I can say is that there wasn’t anyone else there,” she recalled. José, a lawyer, was the one who first warned her that she would be jailed over the birth. He went so far as to suggest that she flee to the US, but she refused. Frías was detained in the hospital that same week, before being transferred to a detention center and later to the Center for Social Rehabilitation (CERESO) in Ensenada. José, who is a lawyer, told her that she would have to spend at least six months in jail during the trial and sentencing process. Meanwhile, some local newspapers were coming up with a different narrative, according to Frías — one paper said she slammed the fetus against a wall, while another said that she had buried it. Her fellow inmates would ask her if she was really the evil character depicted in the local press that had shocked society in Ensenada. Her brother had to intervene — with expert reports and the threat of a lawsuit in hand — to warn editors against publishing such stories. “They were outraged by how they found the baby. Had they said, ‘Crazy lady locks baby in a suitcase’ or something else, that would have been easier for me to accept, but they had no idea of what really had happened,” she said. According to Frías, the theory held by the Office of the Public Prosecutor was that she wanted to “get rid of the baby” because José wasn’t the baby’s biological father. (Malice is part of the criteria that Mexican prosecutors use to determine if the offense counts as homicide of a blood relative.) Their experts determined that the fetus died from asphyxiation and was incinerated. Attempts by BuzzFeed News to reach the public prosecutor from the time of Frías’s case went unanswered. When the DNA tests ordered by the Public Prosecutor came back, it was determined that Miriam and her boyfriend were indeed the parents. Miriam recalled a sense of relief, since it confirmed the lack of evidence against her. 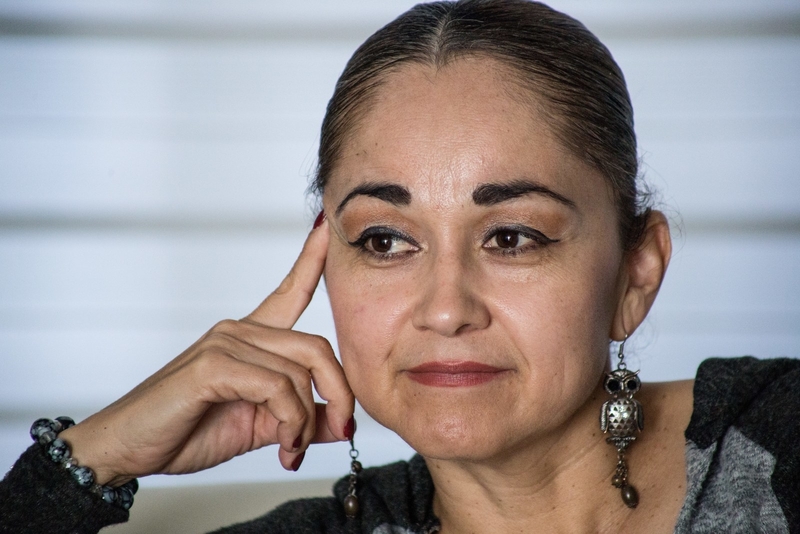 Miriam was sentenced a year after she was jailed by Amalia Gutiérrez de la Peña, a judge who has recently been in the news after releasing a sexual assailant in Ensenada. She was expecting a sentence of one to six years in jail. Instead, she was sentenced to 27 years and 5 months for the homicide of a blood relative. “The judge told me that nothing I could do would help me, that she was not going to release me no matter what legal remedy I presented, and I broke down in tears. I said, ‘You have to abide by the law,’ and she replied, ‘That’s exactly my point,’ and left. I knew that I was screwed but I didn’t know how badly,” she declared. While incarcerated at CERESO, Miriam taught literacy and preparatory classes; she was the first woman to do so. She played basketball and softball, learned to sew and cut hair, and went to therapy. She immersed herself in her Catholic faith and handicrafts, received visits from her family, and ended her relationship with José. She seemed accustomed to her routine but never got used to the idea of missing her daughter, who had been told that she was away traveling. “My daughter kept asking, ‘Where is my mother, it’s been a long time.’ It is…it was very difficult to tell her where I was. When she had her 9th birthday, my father brought her to see me. I don’t know — I’d say that my daughter is very special, because she never saw things in a negative light. She wasn’t affected by the fact that I was in jail,” she said. According to a 2009 report by the Ministry of Health, clandestine abortions are the second leading cause of hospitalization in Baja California, with 1,846 cases, a number tied closely to the inability of women who go to public health centers to have their pregnancies legally terminated. Las Bloodys, a collective that has been accompanying border-town women into the United States to get abortions in a medical setting for the past three years, indicated that women with visas and economic resources are the only ones who have access to services to legally interrupt their pregnancies because they can travel to San Diego, California, where there is a Planned Parenthood clinic. “There is the question of class privilege. Many women have access to enter the US because they have visas and money to pay Planned Parenthood. The rest don’t have access and will be forced to opt for clandestine and unsafe procedures,” said Yessica Lizbeth, a member of the collective. 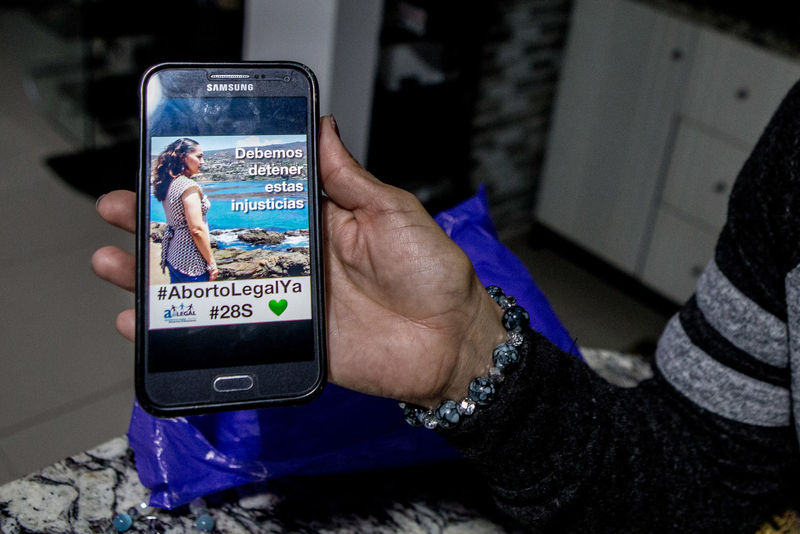 Documents provided by the activists show that in San Diego, walk-in abortions for pregnancies of up to 23 weeks and 6 days can cost up to $3,000, or nearly 60,000 Mexican pesos. Another option is to travel to Mexico City and have an abortion free of charge in any public health clinic — but only during the first 12 weeks of pregnancy. In her thesis written for the Colegio de la Frontera Norte, “Cruzar la frontera para abortar en silencio y soledad,” Norma Ojeda indicates that Mexican women represent 15–31% of all women who have abortions in San Diego and Riverside. But Ojeda’s data is from 1993, and she points out how difficult it is to get these numbers since many women who go to clinics in Baja California register under a US address. “Even if those who cross the US border to get an abortion are able to escape the threat of jail and health risks, they don’t necessarily escape from the social isolation of having to experience an abortion and its aftermath,” she wrote. Data can be requested through transparency laws, Aguilar said, but there is hardly any reliable information available regarding the number of women convicted for the homicide of a blood relative after they suffered a miscarriage. GIRE indicates that the authorities register all homicides under the same category without specifying which ones belong to cases of abortions or to miscarriages. The first thing Miriam did when she got out of prison was to have tacos de carne asada for dinner with her daughter and family. Just five months have gone by since her early conditional release was granted, after she got her sentence reduced to 22 years on appeal, dropping one of the charges against her. While she was telling the story of her release, after having served 63% of her sentence, she received a call from CERESO. One of the inmates wanted to know if Miriam had already helped her to pay her bail, to which Miriam replied yes. “It’s true. Don’t cry because I’ll cry as well, call me and I’ll go pick you up,” she said. Miriam, who is now 48, is a leader among the remaining inmates, whom she helps as if they were her sisters. “I’m not going to waste my time chasing ghosts, I already lost too many years of my life for me to be shutting myself away or being afraid at this point. I want to be well for my family and my daughter. I came back home as if I’d never left,” she said. 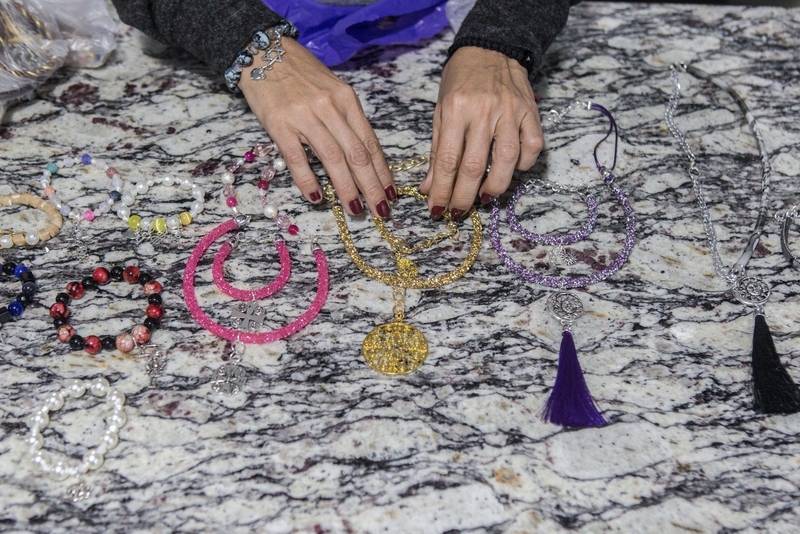 After leaving prison, she decided to set up a costume jewelry business to employ women who are still in jail and who probably — because of their age — won’t be able to find jobs when they get out, other than working at the maquilas along the border. Prison authorities granted her a loan for raw materials after María Dolores Rivera, the president of the National System for Integral Family Development (DIF) in Ensenada, said how delighted she had been by the necklaces and bracelets she’d seen. Having a job is one of the requirements the judge imposed as part of her parole over the next seven years. Miriam also has to have a permanent address, comply with drug screening exams every two months, and report to CERESO every month. 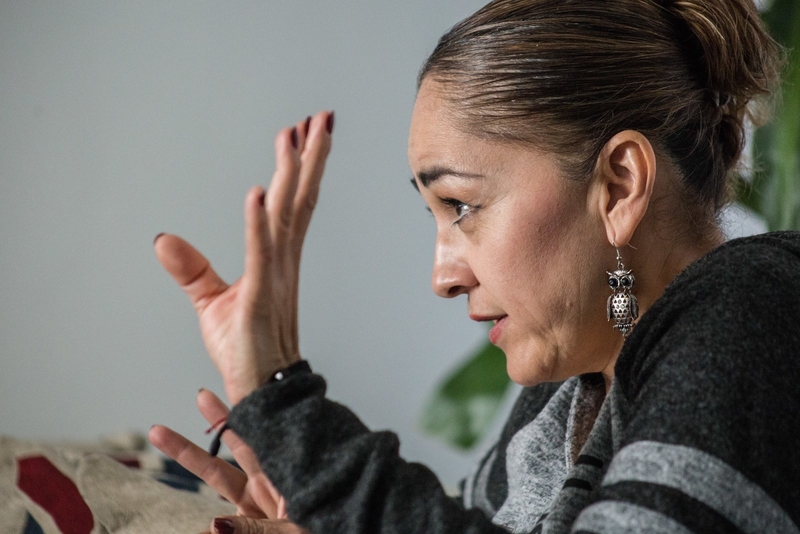 She still has to request authorization to travel and she has no political rights — she was unable to vote in Mexico’s national elections earlier this year. In spite of these restrictions, Miriam seems relaxed and smiles like someone who has just regained her freedom. She currently spends her time at work, going to the movies and to the malecón, and catching up with old friends. She divides her time between her parents’ house and the house of her current partner, Felipe Sánchez, a motorcycle enthusiast with whom she shares an admiration for Marilyn Monroe. This year in Mexico, women have organized to demand the legalization and decriminalization of abortion to prevent more cases similar to Miriam’s from happening again. They followed the lead of women in Argentina who have made concrete proposals to legislators and who took over the streets to demand reproductive rights. Although congresswoman Lorena Villavicencio, from the National Regeneration Movement (known by its acronym in Spanish MORENA), presented a bill to decriminalize abortion up to 12 weeks into a pregnancy nationwide, her effort to amend the Federal Criminal Code has been called into question because it doesn’t repeal any of the sanctions against women who have abortions. In an interview with BuzzFeed News México, Villavicencio made it clear that criminal sanctions would be taken into consideration, and that they would try to avoid prison sentences. “We will look into alternatives to prison sentences, such as community service. We’ll find another way, but we’ll avoid prison sentences for women at all costs,” she said. Faced with the fact that such a reform wouldn’t help women already incarcerated for miscarriages, Villavicencio said that they would consider those cases for amnesty as proposed by newly inaugurated President Andrés Manuel López Obrador, the founder of MORENA. “There is a proposal to pardon women who are currently in jail for this situation. This proposal would enforce a constitutional principle that goes beyond what the Criminal Code states. It would go into effect once we begin to evaluate the possibility of amnesty for pregnant women, as well as for women linked to crimes related to the possession and traffic of marijuana,” she said. After Miriam’s time in prison, her Catholic faith has led her to feel that sometimes she is in favor of abortion and sometimes she’s not.